MACAU -- The scuffle that erupted between the camps of Manny Pacquiao and Brandon Rios on Wednesday Macau time was not scripted in the manner that a professional wrestling match is staged. But this was an entirely predictable, and preventable, occurrence, that happened only because no one took the simple steps required to stop it. That falls totally on the shoulders of the promoter, Top Rank. The animosity between Pacquiao trainer Freddie Roach and Rios strength and conditioning coach Alex Ariza is real and was well known to boxing insiders for years. 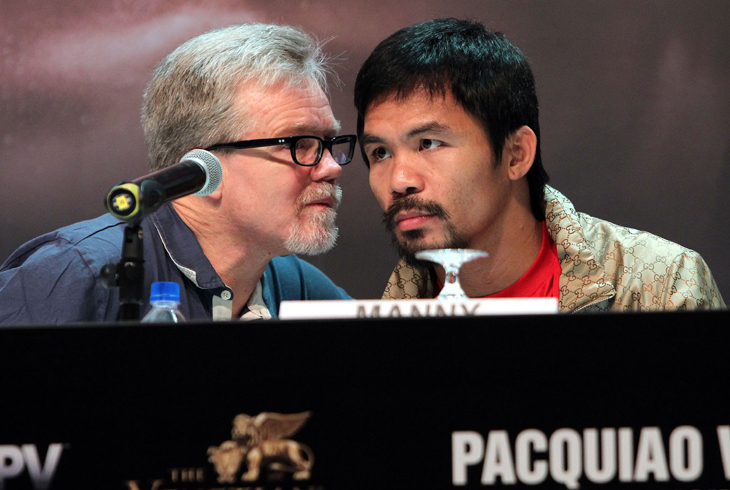 In August, Roach fired Ariza as Pacquiao's strength and conditioning coach. Allowing them to linger in the same area with no significant management and security presence was inviting trouble. Further, Roach has an intense dislike for Rios and Garcia since they mocked him for his Parkinson's Disease in a disgusting 2010 video that was released days before Pacquiao fought the Garcia-trained Antonio Margarito in Dallas. Allowing Roach and Ariza to cross paths without taking steps to prevent an incident is akin to allowing it to happen. Both Rios and Garcia wanted to use the gym in the morning, since they will fight Sunday morning Macau time. So, Top Rank gave Pacquiao the first choice, and he reserved the gym for 11 a.m. Rios then took the 9-11 a.m. slot. "We were fine with that because Manny Pacquiao is the star and the one who has been in 15 pay-per-views, and he deserved to be able to make the choice," Garcia said. But Rios had an interview with ESPN that went well past its time and so he started to train 20 minutes late. Roach showed up at 11 and after waiting for 10 minutes, moved to Garcia and wanted the gym. Both trainers had a point. Rios wasn't able to finish his workout because he began late, and he was close to being done. But Roach had the schedule set and he deserved the opportunity to begin his workout as close to on time as possible. The ugly scenario that unfolded could have been avoided had officials from Top Rank having taken charge and anticipating that something could happen. When it first occurred, numerous Top Rank employees rushed into the media center to tell reporters who were working at the time what had occurred. That included Top Rank CEO Bob Arum, who even at the news conference later that night joked that he should bring in Judge Judy to arbitrate the dispute. On Thursday morning Macau time, however, Arum was singing a different tune. "The Chinese like things very orderly and no hooliganism like that," Arum said. "Of course, when they're in the ring, they want them to fight, but they don't like stuff outside of the ring. That's why it wasn't good. That could blow everything here." Clearly, someone had spoken to Arum. But with a little forethought, he would never have had to worry about it. The ugly escapade could have, and should have, been prevented.